by Virginia T. McLemore, 2001, 62pp., 13 tables, 5 illustrations, and 1 oversize map, scale: 1:1,000,000. Silver and gold have been found in 163 mining districts and other geographic locations in New Mexico. 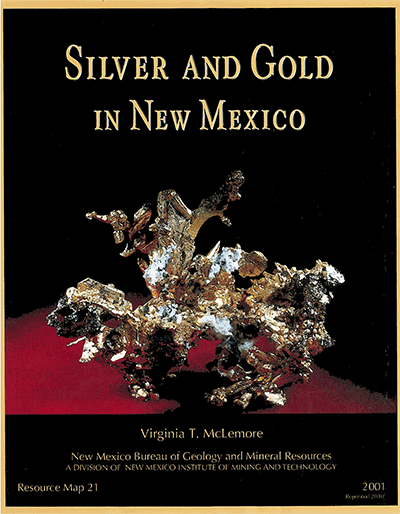 More than 3.2 million oz of gold and 117 million oz of silver have been produced in New Mexico from 1848 through 2000. Production from most districts has been small; however, 14 districts have produced more than 3,000,000 oz of silver, and together they account for approximately 80% of the total silver production in New Mexico. Ten districts have produced more than 150,000 oz of gold, and together they account for approximately 96% of the total gold production in New Mexico. Silver and gold are found in 14 distinct types of deposits that range in age from Proterozoic through Holocene. Five deposit types have produced significant gold and/or silver as the primary product: placer, volcanic-epithermal, Great Plains margin (alkaline-related), carbonate-hosted silver-manganese replacement, and Laramide vein. Four deposit types have produced significant silver and gold as byproducts of base-metal production: carbonate-hosted lead-zinc replacement, Laramide skarn, porphyry copper, and Proterozoic massive-sulfide. The five remaining deposit types with minor silver and/or gold production are: copper-silver (±uranium) vein, Rio Grande rift, Mississippi Valley-type, sedimentary-copper, and vein and replacement in Proterozoic rocks. All 163 mining districts are described in the text and located on the 24" x 29" map. The text also describes the classification of silver and gold-bearing deposits into 14 distinct types. RM-21 supersedes RM-15.